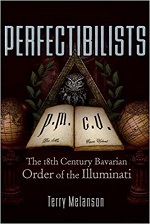 The book starts with history of the Illuminati, how Adam Weishaupt got the idea, how the organisation grew, split up and came to its end, etc. Several times the book gets this “look here: CONSPIRACY!” tone that I hoped a descent work about the Illuminati would avoid. The historical information is alright, but the book gets better in the parts about the structure and about the philosophy of the organisation. There appears to be some irony in the book. Sure, the Illuminati conspired to gain influence in order to change society. They recruited well-off and influential people, many of them were also Freemasons. They never got really big though, the estimation has 2000 to 3000 members at its peak. For all the fuss about the New World Order that is so popular today, what the Illuminati actually seemed to try to accomplish are things that many nowadays rave about: global village, equality, freedom of speech, secularism. That said, half of the book is filled with short biographies of known Illuminati. Some of the other appendices are mildly interesting. The texts of Weishaupt himself give a nice look into the man’s head and the parts about the workings of the organisation give an idea of it. The Illuminati were a secret society but certainly not an esoteric one. Weishaupt had nothing with religion, esotericism and only an interest in mystery traditions to learn how a secret society can influence society. The Illuminati were a political organisation whereas other organisations that they are often lumped together were/are not. I guess I learned a thing or two about the Illuminati reading Melanson’s book, but to me it more seems like a collection of information, quite like when you look around the world wide web, than a structured book. Neither does it anywhere really seems to go into much depth. How did Weishaupt try to change society and into what direction? Why was there so much opposition when the direction that the Illuminati seemed to aim at was a direction that society was going into anyway? Who opposed the Illuminati and how? There is much more information about individuals involved in the organisation than in the organisation itself.